Pentacles were not permitted on veteran gravestones1, workplace discrimination has and continues to happen2, prison inmates are often not provided equal access for their spiritual accommodations3, there’s a lack of representation amongst military chaplaincy4, and Pagan temples fight for survival5—these are just some of the examples of discrimination modern Pagans have found and continue to find themselves contending with as part of their reality as a minority religion. If not subjected to institutional discrimination, Pagans still encounter a lot of prejudice and antagonism from peers and individuals within broader society. Who hasn’t encountered misinformation about Paganism, from the banal stereotype that it’s something into which only Emo teenagers dabble, to the more malicious belief pervasive in evangelical Christianity that Pagans worship evil, harm and abuse other living things—human and animal—and consort with the malevolent demons of Christian mythos? Yet, despite all of these personal experiences with prejudice and discrimination, Pagans themselves are often perpetrators and perpetuators of these very same problems. While many of us grow up and educate ourselves to correct our gross misinformation, so many within our communities remain confused, misguided, or in possession of completely incorrect information about other minority traditions. In recent years, one of the traditions to come into focus for Pagans has been Haitian Vodou. 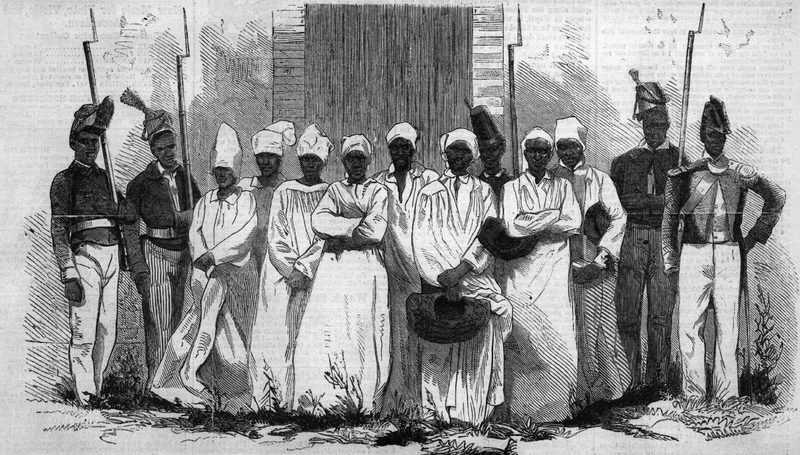 A sketch of the eight Haitian Vooodoo devotees found guilty in 1864 in the affaire de Bizoton. The persecution of and prejudice against Vodouisants continues today. A religion of the African Diaspora, Vodou was born from the syncretism of native traditions defiantly held by the African men and women brought to the West by the slave trade and the Catholicism forced upon them by the slavers. Vodou, unlike many Pagan traditions, is monotheistic and as such professes belief in a single god—in fact, the same god of the Bible. Vodou also teaches that there are non-divine, ancestral spirits, the Lwa, who intercede on the behalf of its practitioners. Vodouisants (the proper term for someone who practices Vodou) build and sustain relationships with the Lwa through regular ritual, both personal and communal, so that the Lwa might be propitiated and invested in them and therefore be oriented towards assisting them through life. But Vodou is also a tradition that, historically, has been and continues to be oppressed by mainstream cultures and religions in the West. It should be a great shame to us, as members of other minority traditions, to find ourselves perpetuating and reinforcing that oppression and ignorance. To help dispel our misunderstandings and ignorance with regard to Vodou, I asked for help from someone who lives this tradition: Mambo Chita Tann, a voice respected within Vodou and by many Pagans. Benny (BB): Would you tell us a little bit about yourself? Mambo Chita Tann (MCT): I’m Mambo Chita Tann, and I’m in my mid-40s and have been a Vodouisant for a little less than 20 years. I am also a doctoral student, and clergy in another unrelated polytheist religion. BB: Are you considered a priest of your tradition? An initiate? MCT: I am a mambo asogwe, which is a priest rank (the highest priestly rank); I am also an initiate. BB: Are they the same thing? MCT: Initiation is required to be a priest in Haitian Vodou, but not all initiates become priests. BB: In what ways is being a priest different than being an initiate of non-priest rank? Are priests officiates of rituals like they are in, for example, Christianity? That is, is being a priest(ess) in Vodou orient one towards service of laity? MCT: Yes, Vodou priests lead ceremonies, instruct and initiate laity, and also serve the spirits on behalf of the laity – we are the most likely to be creating and doing the healing and other ceremonies that assist people in their lives, as well as all the rites of passage. BB: Do you need to be a priest to work with the Lwa directly? How do the non-priest initiates interact with the spirits and what roles can they serve within the tradition as a whole? MCT: Nonpriests can serve the spirits, but only on their own behalves and informally on behalf of other family members. They are not given the license or the training to perform the group ceremonies, the rites of passage, or the heavier types of work (divination, healing, sorcery, etc.) that priests do. Nonpriests do interact with the spirits, both on their own and in ceremonies with priests and laity. They form the backbone of the Vodou sosyete (society) and cook the foods, sing the songs, dance the dances, and welcome the spirits that the priests are invoking and directing for their benefit. It’s a highly symbiotic relationship between laity and clergy. BB: How long have you been a member of this tradition? MCT: Since 1992 or so. I have been a mambo since 2001. BB: Is my summary of Vodou in the first part of this piece accurate? Is there anything you’d add or correct? MCT: there is a strong disagreement over whether Vodou is actually a religion or if it’s just a magical/ancestral tradition that comprises parts of other religions. Not even all Haitians agree on this [or that it is monotheistic, she advises me after reviewing a draft of my introduction]. BB: Does it have a unifying set of principles—a doctrine? MCT: Other than that there is a world of spirits beyond this world we live in and that the spirits want us to be healthy and happy, I’m not sure that Haitian Vodou has an overarching doctrine. It’s a practice-based tradition much more than a dogma-based one. BB: What does it say about the nature of the Divine, if anything? MCT: The creator (“Bondye,” or “the good god”) is beyond understanding or description. We are provided with the Lwa, or the angels/helping spirits of Bondye, for our needs, while Bondye keeps the universe running. BB: So, do Vodouisants communicate directly with Bondye? Or only through the Lwa? MCT: Vodouisants honor Bondye as the first being at the beginning of all prayers and ceremonies, but generally it is the Lwa that do the work and communicate with us. BB: Are there specific ways to address or interact with the Lwa? Or are they open to anyone who wants to interact with them? MCT: There are traditional ways to address and interact with the Lwa that are taught family to family, through a chain of transmission and initiation. There’s nothing stopping people from attempting to contact the Lwa on their own, but being certain that you are really interacting with the Lwa, and forming a strong relationship, comes through the training and license of the traditional methods. It is generally not a solo practice in Haiti; Vodou is a family legacy and an unbroken tradition within many thousands of individual lineages. BB: What are some other important aspects of your tradition? MCT: Emphasis on healing, possessory work, magical work, cultural heritage of Haiti are all big parts of Haitian Vodou. BB: Does your tradition fit under the “big umbrella” of Paganism? MCT: Not really in and of itself, though there are Pagan/Polytheist Vodouisants. BB: If not, why not? Does it share any commonalties with Pagan traditions beyond those that all spiritual traditions have (e.g., the enrichment of human life, etc.)? MCT: Haitian Vodou is an ancestral magical practice and is almost always practiced in tandem with Roman Catholicism. There are “pagan” elements in Catholic Christianity that find their place in Vodou, such as the veneration of saints and relics, observance of certain holidays and other practices that ultimately derive from Roman paganism and not from Jewish practices. BB: Is there a typical format to the traditions’ rituals? Is there an underlying goal to all of the rituals (e.g., communion)? MCT: Formal ceremonies are marked by a Catholic style liturgy sung at the beginning, followed by drumming and singing in various African tribal styles and manners. The underlying goal of Vodou ceremony is to greet the ancestors and the spirits and seek healing and education and protection from them. BB: What have you found to be the biggest misconceptions about your tradition amongst Pagans, in particular? What’s the worst misconception Pagans tend to have, in your opinion? MCT: That the Lwa are “gods” like Pagan deities is probably the biggest one I know of; the rest of my pet peeves have to do with misunderstandings based on racist Vodou tropes, and are not unique to Pagans. BB: Would you be able to elaborate on some of those racist Vodou tropes? Would those include the idea of Vodou being “dark” or “evil” magic versus the “light” or “good” magic of European witchcraft? The use of “Voodoo dolls”? MCT: Yes, they would. The biggest tropes are that Vodou is only evil and only used for evil, hand in hand with the idea that it’s “black magic” both in the evil sense and in the African sense. Pins in dolls and zombies are the legacy of bad horror films that were created during the 1920s-onward U.S. occupation of the island – racist politics gone very wrong. Such damaging tropes and misconceptions aren’t unique to Pagans, but it is disappointing to watch Pagans happily accept them without question. BB: Where do you think this misinformation comes from? Are these misconceptions new ones or are they old ones that members of your traditions have had to contend with for a while? MCT: I think this misinformation comes from the same place that assumptions about a single goddess and/or god come from; a well-meaning but misplaced desire by a certain subset of European-American Wiccan oriented Pagans who want to universalize practice. We’ve had to contend with this since Haitian Vodou hit the Pagan radar with the Feri tradition, and it has only gotten louder in the Facebook age and with some non-Haitians saying things they don’t really know anything about being taken as truth for all kinds of Vodou. BB: I’m not familiar with Feri’s interaction with Vodou and I could guess that many others aren’t. Would you please elaborate more on that history and its fallout? MCT: I’m not incredibly knowledgeable about it either but am aware that Victor Anderson had some interaction with Haitian Vodou. Whether or not he was actually initiated or went to Haiti, or whether he just plugged Lwa into his magical system, I am not entirely aware. You would probably have to talk to a Feri initiate to get more details on this. I am told, however, that this is where the Neopagan interest in Vodou got its start. BB: Do you think some of it is based on fear? MCT: Yes, because there is latent and overt racism involved in the understanding of Haitian Vodou, just as there was in its creation in the first place. BB: Could you talk more about the overt and latent racism present in the West’s treatment of Vodou? How is it expressed? MCT: This is the subject of several chapters [of her book] and it’d be a book on its own. Haitian Vodou has been demonized, literally, since it was a tool of black freedom on Hispaniola/Ayiti (the island), and it has never ceased to be paired with the idea of dangerous black people who are wild and just want to kill white people. The Catholic church has demonized it, the US government demonized it, Hollywood demonized it and it just persists. BB: Do Pagans tend to be more open-minded, less, or about the same as mainstream cultures and religions? Why do you think that is? MCT: I think it’s about the same for people in the same sociocultural brackets. I think much of the issue of open- or closed-mindedness when it comes to American Pagans at least is more related to white privilege and a lack of familiarity with persons of color and the history of colonialism, than to anything in Paganism. BB: Should Pagans, by virtue of their own minority and marginalized status, have a better track record than they do when it comes to interacting with and understanding their peers of other minority and marginalized religions? MCT: You’d like to think so, but unfortunately, socio-economic status still seems to trump religious status. BB: Have Pagans unintentionally adopted the prejudices of the over-culture with regard to your tradition? MCT: I think they’ve intentionally done it in some cases. I don’t believe that Pagans have confronted the issue of white privilege or of their response to colonialism adequately if at all, and there are some serious issues in the Pagan community around people of color. BB: Can you provide an example of how someone in the Pagan community intentionally adopts the prejudices with regard to Vodou? BB: If you could change the dynamic between the Pagan community at large and your community, how would you change it? What would you ask of the Pagan community? MCT: I don’t know that I care enough about the Pagan community at large to put in that kind of work with it. Haitian Vodou is not a dying religion by any means, and whether or not Pagans understand it or not is not something that Vodouisants put a lot of concern into. We also don’t really care what anyone else thinks about us, either, so it’s not a particular issue with Paganism. I personally find it frustrating that people profess interest in the tradition and often do very little to learn about how it really is, but again, the problem seems to be on the other end. Vodou is a closed community and while the door is always open for those who sincerely come to knock, there is no sense that we are going to be out there looking for people to show the door to. That’s not meant to be rude; there’s just no proselytization or need to show off/find more people in what is largely an indigenous tradition. BB: Is there something that Pagans who want to be aware can do to be more respectful of Vodouisants and their tradition? MCT: As when encountering any tradition one isn’t part of, respectfully listening to the practitioners when they tell you who they are and what their tradition is, instead of trying to explain it to them, goes a long way. Being aware that it is generally not polite or acceptable to make changes to the tradition, which doesn’t need saving and isn’t in danger of dying out. Simply being respectful of it in the first place. BB: Are there any important issues or questions I missed that you think it’s important to relate here? MCT: I think these are good starting points, and if you want to expand on anything here, please let me know – I am speaking very broadly on purpose. BB: Any other final comments or statements you’d like to add? MCT: Thanks for asking these questions. I hope they were helpful! BB: They were! I learned a lot! If you have additional interest in Haitian Vodou or Mambo Chita Tann’s published work on the tradition, you should consider her book, “Haitian Vodou: An Introduction to Haiti’s Indigenous Spiritual Tradition,” available for purchase at her website: http://www.legbastore.com. I know I’ve certainly added it to my reading list! This is an excellent interview. Thank you for posting it! Thank you! It was a pleasure interviewing Mambo T and getting to experience her insight first hand!